The Nuttall's Woodpecker is a woodpecker that is found almost exclusively in California. Nuttall's live year-round in a very limited range. Mostly in the western part of California with a slight dip into the northwest area of Baja California in Mexico. There have been accidental sightings in Nevada and southern Oregon. But for the most part Nuttall's Woodpeckers are California birds. The Nuttall's appearance is very close to the Ladder-backed Woodpecker. There will be several factors in your determination of which one you are observing. First is the location. Nuttall's live year-round in a limited range mostly in the western part of California. So if you see one outside that range, observe, document, and try to get a picture because it is highly unlikely, and other birders will be skeptical. Habitat is another key to identifying the species. The Nuttall's Woodpecker likes woodlands--either oak woodlands or riparian woodlands. The Nuttall's likes trees and streams and lakes. Or at least trees that grow in moister areas. 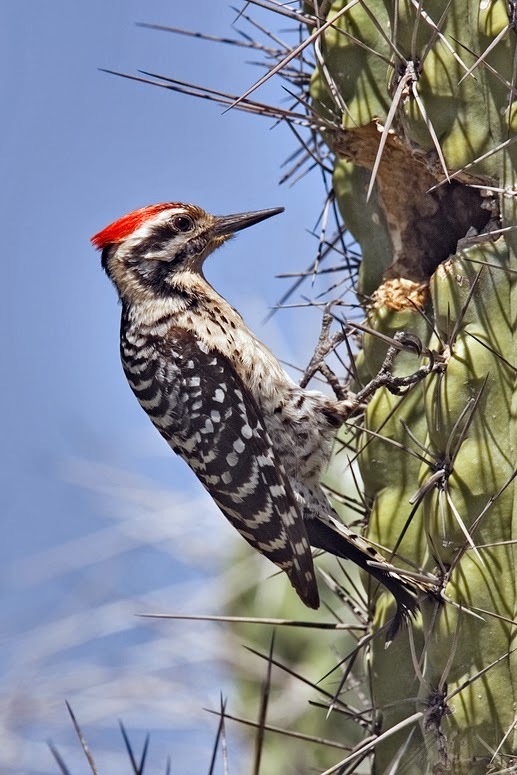 On the other hand, the old name for the Ladder-backed Woodpecker is the "Cactus Woodpecker." And that tells you about the Ladder-backed Woodpecker's proclivity for drier habitats. It lives in the desert areas of California such as the Antelope Valley of Los Angeles, the Inland Empire, and in San Bernardino County. The Ladder-back is usually found in the drier habitat the cacti, the Joshua tree, the mesquite. The Nuttall's is in the shadier, moister habitat out in the eucalyptus, the oak, and the cultivated trees in the park. The Ladder-backed Woodpecker is a desert bird with a much larger list of states in its range: California, Arizona, Nevada, New Mexico, Texas, Oklahoma, Colorado, and Kansas. Its range also extends down into Mexico as far south as the Yucatan Peninsula with some localized sightings down as far south as the Republic of Nicaragua. To find both the Nuttall's and the Ladder-backed Woodpeckers you would need to find both their habitats together in one place. Big Morongo in San Bernardino County is one of the few places where you will find both species, but you will almost never find the Ladder-backed Woodpecker in Orange County. Female Nuttall's Woodpecker in Huntington Central Park. (Photographer, Karen McQuade, copyright). The other thing that will help you decide if it is a Ladder-backed Woodpecker or Nuttall's Woodpecker is the thick, black stripe at the top of the back stripes. Notice that in the picture above, even though her head is turned, you can still make out that the top stripe is a much wider, black bar than the rest of the back stripes. This is is key to identifying the Nuttall's Woodpecker. The Ladderbacked Woodpecker does not have the thick, black bar at the shoulders. Check out the illustration below. The Ladder-backed Woodpecker is the upper illustration. 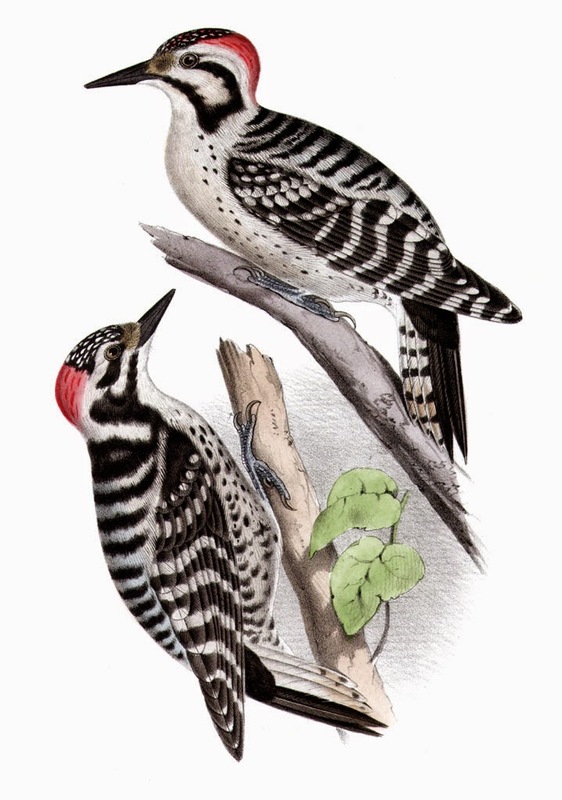 Notice in the illustration above of the male of each species, the upper image of the Ladder-backed Woodpecker has no thick stripe at the shoulders and that the male Ladder-backed Woodpecker has some small red spots on the head. 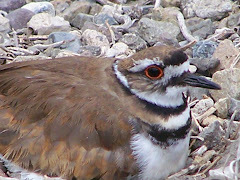 The male Nuttall's has a thick terminal stripe at the shoulders and only small white spots on the head. Male Nuttall's Woodpecker in Huntington Central Park (west side). The tail feathers help with balance. In Orange County, if you find what you think is a Ladder-backed Woodpecker, document, document, document--and take lots of pictures, because you just don't find them often if at all in Orange County. Now if you go into Riverside, San Bernardino, Mojave, then yes, there you are likely to see a Ladder-backed, but not in Orange County. Female Nuttall's Woodpecker in Huntington Central Park. Notice the thick, black terminal band at the shoulders. (Photographer, Karen McQuade, copyright). Huntington Central Park is one of the many areas in Orange County where you can see a Nuttall's Woodpecker. They breed here. Nuttall's Woodpeckers are all over the east side of Huntington Central Park in the area between the garden and the lake. 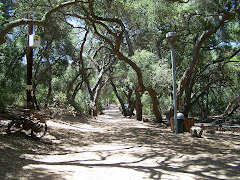 You will also find them in the area up from the parking lot in the pepper trees adjacent to the library parking lot to the east of the library, and in the eucalyptus near the bathroom as you follow the higher path rather than going down toward the lake and the garden. You will also find Downy Woodpecker's in the same areas. Downy Woodpeckers are easily differentiated from the Nuttall's Woodpecker. The smaller Downy Woodpeckers have a large white area in the middle of their back which is easy to differentiate from the Nuttall's striped back. Downy's are less associated with oak woodlands. Male Nuttall's Woodpecker in Huntington Central Park. (Photographer, Karen McQuade, copyright). See the thick, black bar across his shoulders? Nuttall's Woodpeckers are all over the east and west side of Huntington Central Park. On the east side of the park in the area between the garden and the lake. I hear them often. You will also find Downy and Northern Flickers in that same area. But there is no confusing them with Nuttall's. Female Nuttall's Woodpecker in Huntington Central Park. Nuttall's Woodpeckers are cavity nesters. They chip out a hole in a tree and set up housekeeping. The males do the main excavation work. The bird above is obviously a male as indicated by the red on the back of the head to the nape. (Be aware though that juvenile female Nuttall's may have some scattered red feathers on the head.) This Nuttall's started low to ground on the eucalyptus tree which was back a bit from the pathway. It then worked its way up. Nuttall's Woodpeckers eat mostly insects such as beetles and ants with a small amount of fruit, seeds, and flowers. They also include caterpillars, a few spiders and other creepy crawlers in their diet. Woodpeckers often start low to the ground in the less traveled areas of this and other parks. Nuttall's often move quickly sometimes moving around the trunk and upward. Frequent flights to other parts of the tree or to another tree are common. While birding between rainstorms in Huntington Central Park, I saw a Nuttall's vigorously bathing in a rain puddle. The Nuttall's has not been studied as much as the Ladder-backed Woodpecker. But we do know quite a bit of information. When looking for the Nuttall's, listen because it often calls its loud, rattling call as it flies from tree to tree. There are recorded instances of Downy-Nuttall's hybrids and unsurprisingly Nuttall's-Ladder-backed hybrids in California at large, and specifically in Orange County by very reliable sources. But these are rare, and again a case in which if you find such a bird, you should document, document, document. And say exactly where you found it so others can try to confirm. There is no offense in this. Science is all about being able to duplicate findings. Even from the side, you can see the broad black band at the shoulders. 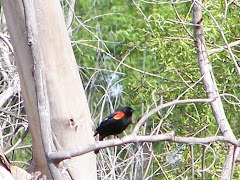 The oakland and riparian woodlands are great places to bird. 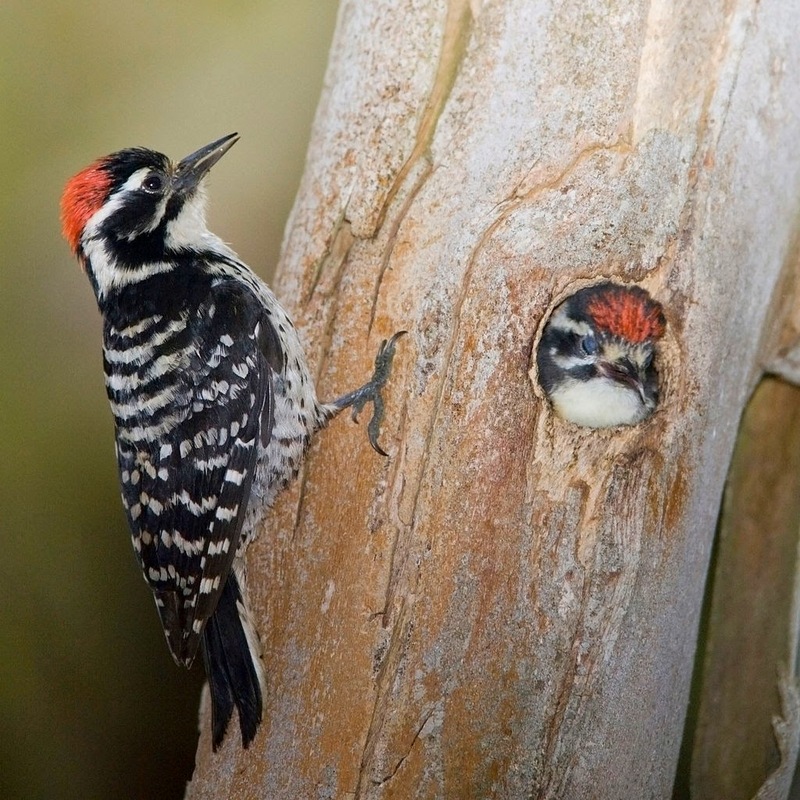 Have fun birding in Orange County, and look and listen for Nuttall's woodpeckers. They seem to be everywhere. 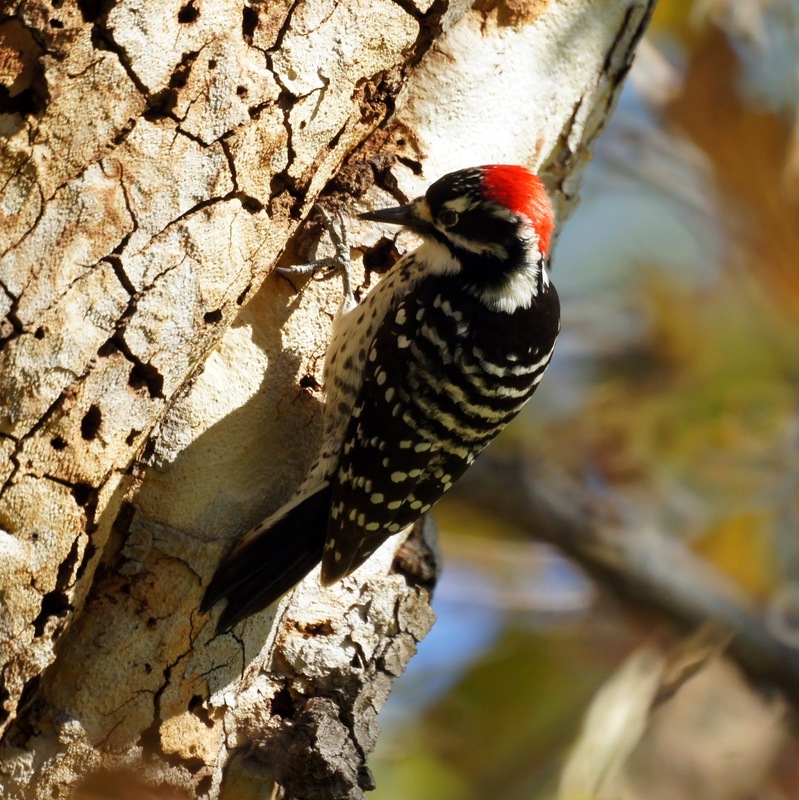 Here are a few areas where you will find Nuttall's Woodpeckers in Orange County, but not the only areas in Orange County. Nuttall's Woodpeckers can be found anywhere there are trees in Orange County. The picture is very big, and you might not see the text. Page down on the Audubon Guide page to read the article about the Nuttall's Woodpecker. Videos and photographs of Nuttall's Wookpeckers. Listen until you recognize the call. Please message me on my OC Birder Girl Facebook page rather than on my blog. I try to respond to every comment, but sometimes with life as it is, I miss a few comments. My apologies to anyone I have missed. Please note that I have zero tolerance for any comments unrelated to birding. I also have zero tolerance for thinly veiled sales pitches disguised as comments on this blog. And I report all spam. Wood Duck or Mandarin Duck? Welcome to My Birding Blog. I'm glad you stopped by. Are you wondering where to go birding in Orange County? Scroll down into the the sidebar, and take a look at some of the Birding Hot Spots listed. You will find community parks, regional parks, nature centers, wilderness areas, and more. Or you can find a good place to birdwatch by clicking on Birding Hot Spots--Orange County. These are posts I have written about places I have birded in Orange County. Looking for a good field guide about birds? Check out my review of birding field guides. Have a comment you want to share? Feel free to post a message about birding in Orange County, comment on a post, vote on the lastest polls, or check the weather before you head out to bird. Scroll down the sidebar for lots of good links to birding information both local and national. · Information about the bird species of Orange County. · Where to go birding in Orange County. 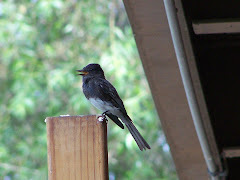 · Information about birding and birding skills in general. 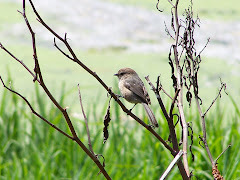 · My birding experiences and bird walks I have been on. 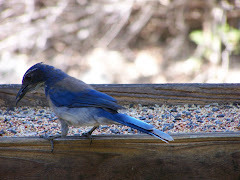 · Attracting birds to backyards in Orange County. The pictures and text on this site are under copyright and cannot be used without written permission from Karen McQuade, the OC Birder Girl. I hope you will find birding (birdwatching) as amazing, relaxing, and just plain fun as I do. We who live in Orange County are blessed to have so many wild and natural places right here where we live. Let's get out there and enjoy these great places. Have fun birding in the O.C.! If you came here to read about the Glass Wall above Bolsa Chica Ecological Reserve, click here. Legal notice: All pictures and text on My Birding Blog unless otherwise stated are copyrighted by Karen McQuade, the OC Birder Girl. Short quotes of text with proper credit are fine. Otherwise, you may not use any material on this blog without written permission from me. Thank you for understanding. I update articles/blogs with more information and more pictures frequently. Since I put a lot of information in each post, the original date I start the blog is the post date, but it may not be the date I publish it. My focus is getting detailed, helpful information about good places to go birding and information about wild birds in Orange County. So check back, articles/blogs are updated and enhanced regularly. I welcome all comments about birding, wild birds, feeding wild birds, gardening for birds birding in Orange County, California, birding hot spots, and other comments related to birding in Orange County. This blog is fully moderated, and so only appropriate, topic-related comments will be posted. I have two great shops for birders. They are great places to find gifts for birdwatchers and for birders themselves. Check out my Amazon OC Birder Girl Store . I have tried to include guidebooks, books on birds, CDs about birding by ear, and DVDs about birding in an easy-to-access format. If there is something you are looking for and cannot find, let me know and I will see if I can locate it for you. If you like my photographs and would like a poster, mug, or other product with one on it, visit my OC Birder Girl Store at Cafe Press. I am just getting started and will be adding more as soon as possible. You can contact me by leaving a comment. Go to the end of a post and click on the comment link. It says the number of comments there already. Clicking on this link is how you comment or send a message to the OC Birder Girl. I moderate the comments and see your message. I am happy to answer questions about birding or about the posts. The comment will not be published if you request that it not be published. If you have a question and would like to ask for information about birding, wild birds, or feeding wild birds, go to Ask the OC Birder Girl and post your question. I will answer it on that page. I have been a birder for a few decades. It all began when I took two classes about birding at a Community College. The classes were Inland Birds and Coastal Birds. There was a great teacher who would note a bird flying in with the comment: "Someone just flew in." We were skeptical and awed when a bird would whirl by and Bev would say, "sparrow," or some other bird family or species. Did she really see it? Or was she making up all these birds whirling past? Now I know she did really id them. Familiarity breeds recognition. Another friend and I began a birding journey in those classes that still goes on today. I even started an daily email at work about birds that got everyone interested in the the birds in the area. It is a great way to appreciate God's creation and to get fresh air and exercise. I am no longer a teen by any means, but I figure if my great aunts could be referred to as "girls" until they were in their 80's and beyond, I can be the OC Birder Girl. You can contact me about this blog by making a comment on one of the posts. I moderate all comments and will see your message.